There are a few new things that I am trying this year in my classroom. Here is a series of short posts about them. I am terrible about celebrating birthdays. This goes for my personal life (sorry, friends) and even more so in my professional life. 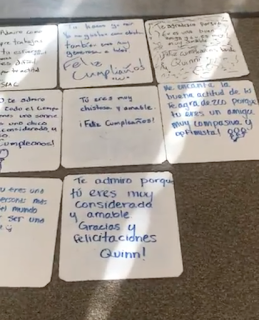 Last year, Laurie Clarcq did a presentation in Comprehensible Online about classroom culture and it was so chock full of ideas that I was instantly inspired and overwhelmed. I decided to pick one thing that I felt that I could manage, and made a plan to do it. That one thing was celebrating birthdays in class. 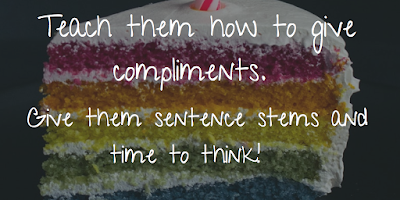 Laurie modeled how she has kids give each other compliments when it is their birthday. While idly browsing someone else's blog (and I have no idea to whom it belonged, sorry!) 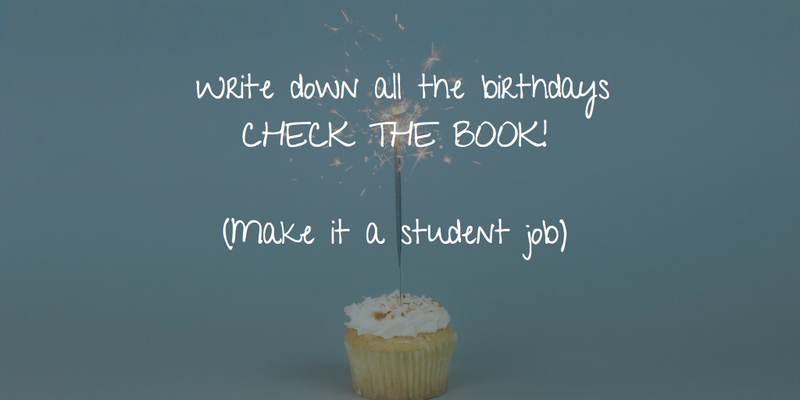 I found this AMAZING free resource on TeachersPayTeachers, which is basically a starter for birthday compliments. It is SO good that I did not edit it at all. I just printed it up (half size, to better fit in interactive-ish notebooks) and passed it out to the kids. 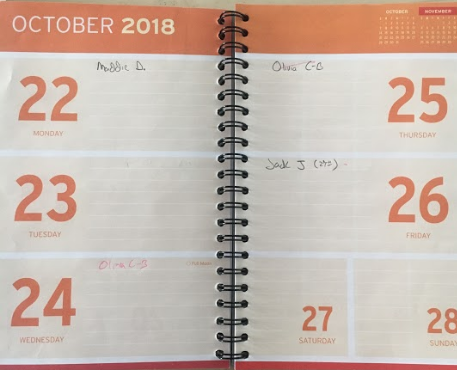 Write the birthdays down in a book. Then came the "remembering the birthdays" part, something that I am terrible at. 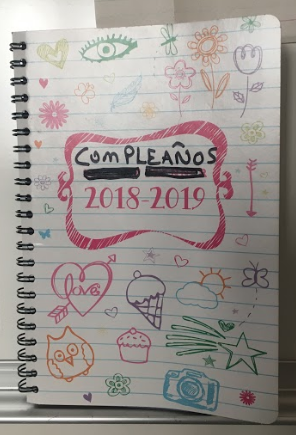 I decided to get a school calendar from the dollar store and write each kid's real or half birthday in it. It took about an hour of precious late summer time, but hey, I got it done. 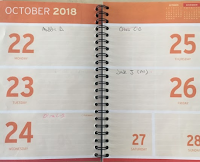 I also decided to make a kid check the calendar as part of class job. This turned out to be great if it was the right kid for the job, and not-so-great if it was the wrong kid. 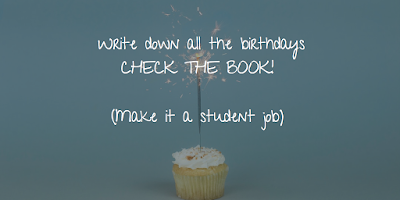 One sweet, sweet girl came up to me in early November to tell me, nearly in tears, that she had forgotten to check the book and that we had missed another student's birthday, and asked me to fire her. Instead, I allowed her to resign and we found someone else to take that over. 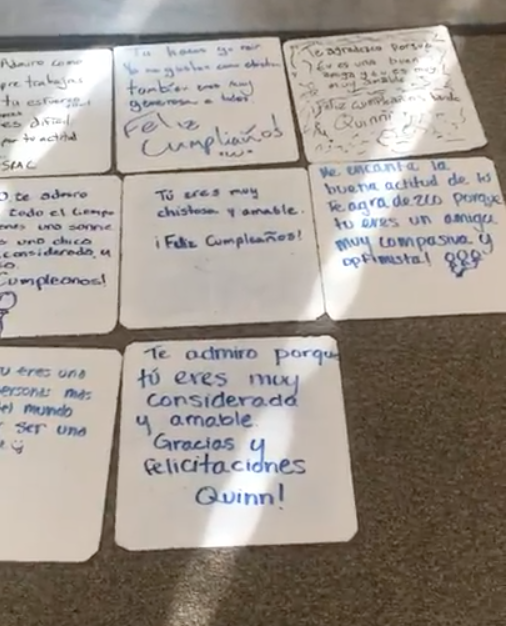 In another class, the student comes in each day and tells me everyone's birthday in each of my classes, for which I am grateful. 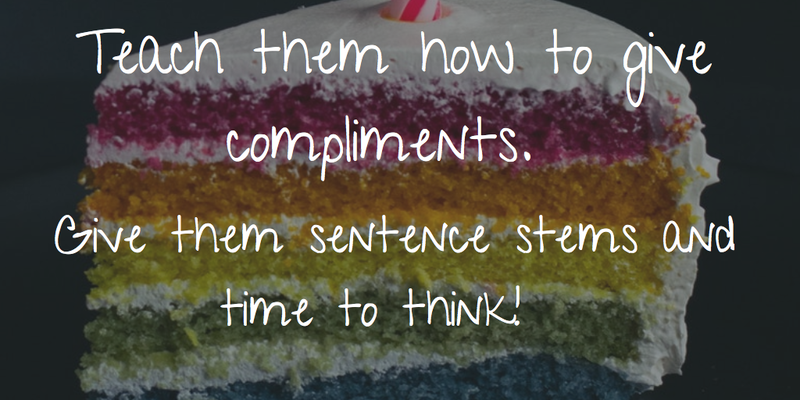 When it is a student birthday, I ask the kid whether they would like us to write or speak our compliments. Either way, the whole class gets out their compliment starters (that are in the back of their notebooks) and a whiteboard. They have a few minutes to think and write. 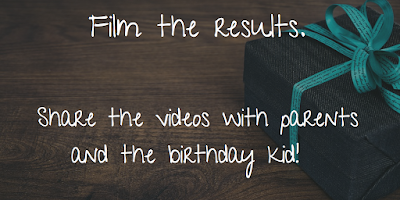 If we are speaking, I just take my phone and film each kid as they read what they wrote. If we are writing, the kids line up the whiteboards and I film myself reading them. 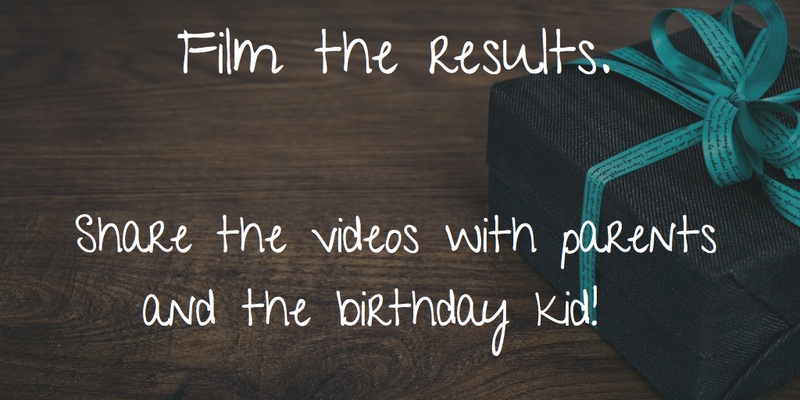 Finally, I send the video to the birthday kid, cc'ing the parents so they can see it too. Sometimes the sound doesn't record, which is a bummer, but it's still better than not doing it. I wish I could measure the impact this has had on my classroom this year, but it is impossible to separate it from everything else. 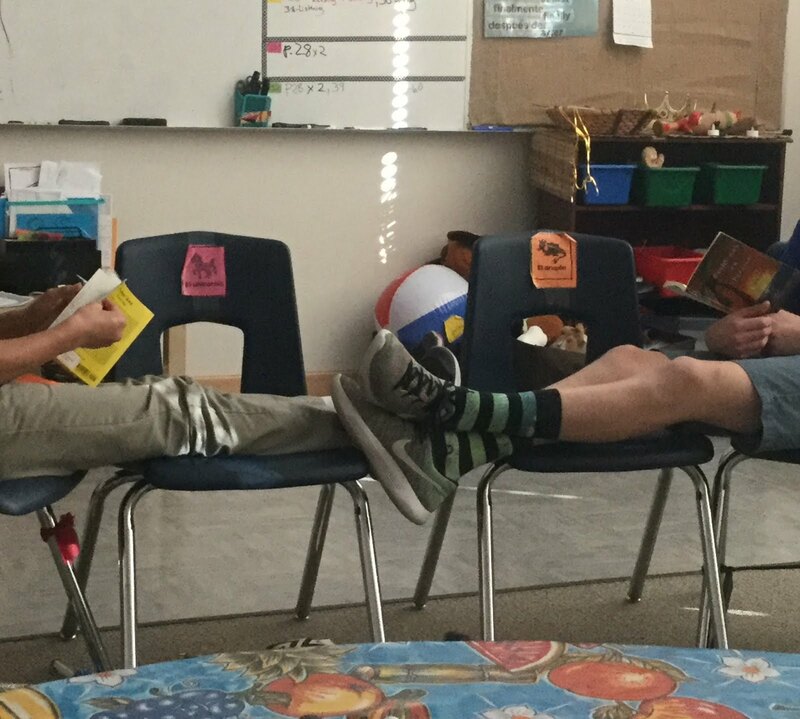 Suffice it to say that I feel like this is the best year ever as far as classroom culture and classroom management. This has got to be a big part of it, and the joy in the room is palpable.